It should come as no surprise to you that we love a good salad at HBFIT. This week, we consulted one of favourite foodies on instagram@the_brooklyn_frauleinto help us take our salad game up a notch. She blessed us with this delicious chickpea and sweet potato salad, and some crunchy Brussel sprout chips that you won’t be able to resist…. is it lunch time yet? 3. Place dried chickpeas on baking sheet and sprinkle with Olive oil and cumin – set aside. 4. Peel sweet potato and cut into small cubes – place onto a separate baking sheet. 5. Peel and slice onion lengthwise – add to the sweet potatoes. Season the onions and sweet potatoes with salt and pepper and drizzle with olive oil. 7. After 10 min, check on the chickpeas – they will be done before the sweet potatoes. Once the chickpeas are slightly brown and crispy take them out. Take the sweet potatoes out when they are slightly brown and cooked through. 12. For the vinaigrette: whisk together the ingredients, season with salt and pepper. 11. Add the spinach into a bowl or serving plate. 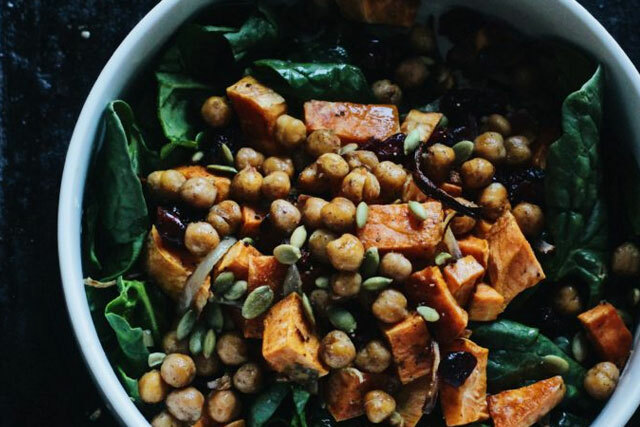 Add cranberries, cooled sweet potatoes, chickpeas and toasted pumpkin seed into the bowl. Dress salad with the lemon vinaigrette and enjoy!